Released 1990: The Macintosh Classic is a personal computer designed, manufactured and sold by Apple Computer from October 1990 to September 1992. It was the first Macintosh to sell for less than 1,000 USD (1,500 USD with 40 MB hard drive and 1 MB RAM expansion). Production of the Classic was prompted by the success of the Macintosh Plus and the Macintosh SE. The system specifications of the Classic are very similar to its predecessors, with the same 9-inch monochrome CRT display, 512×342 pixel resolution, and 4 MB memory limit of the older Macintosh computers. Apple’s decision to not update the Classic with newer technology such as a 68020 CPU, higher RAM capacity or color display resulted in criticism from reviewers, with MacWorld describing it as having “nothing to gloat about beyond its low price” and “unexceptional”. But, it ensured compatibility with the Mac’s by-then healthy software base as well as enabled it to fit the lower price Apple intended for it. Nevertheless, the Classic featured several improvements over the aging Macintosh Plus, which it replaced as Apple’s low-end Mac computer. It was up to 25 percent faster than the Plus and included an Apple SuperDrive 3.5″ disk drive (high density 1.44 MB) as standard. The Classic is an adaptation of Jerry Manock’s and Terry Oyama’s 1984 Macintosh 128K industrial design, as had been the earlier Macintosh SE. Apple released two versions that ranged in price from $1,000 (without hard drive and RAM expansion) to $1,500 (40 MB hard drive and RAM expansion, giving 2 MB RAM in total). A 40 million dollar marketing campaign, the price and the availability of education software led to the Classic’s popularity in education. It was sold alongside the more powerful Macintosh Classic II in 1991 until its discontinuation the next year. After co-founder Steve Jobs left Apple in 1985, product development was handed to Jean-Louis Gassée, formerly the manager of Apple France. Gassée consistently pushed the Apple product line in two directions, towards more “openness” in terms of expandability and interoperability, and towards higher price. Gassée long argued that Apple should not market their computers towards the low end of the market, where profits were thin, but instead concentrate on the high end and higher profit margins. He illustrated the concept using a graph showing the price/performance ratio of computers with low-power, low-cost machines in the lower left and high-power high-cost machines in the upper right. The “high-right” goal became a mantra among the upper management, who said “fifty-five or die”, referring to Gassée’s goal of a 55% profit margin. The high-right policy led to a series of machines with ever-increasing prices. The original Macintosh plans called for a system around $1,000, but by the time it had morphed from Jef Raskin’s original vision of an easy-to-use machine for composing text documents to Jobs’ concept incorporating ideas gleaned during a trip to Xerox PARC, the Mac’s list price had ballooned to $2,495. From there, the price of Mac systems continued to climb: the Macintosh Plus was slightly more expensive at $2,599, the SE was $2,900 or $3,900 depending on the model, and a basic Macintosh II with a 40 MB hard drive was at least $5,500 (at launch, with the price increasing in late 1988). More modern machines cost even more: the Macintosh IIcx was $5,369, the IIci $6,269, and the IIfx $9,900 – all without monitors or keyboards. Color CRTs were relatively expensive in the late 1980s; Apple’s 14″ 640×480 monitor had a list price of $999 and Apple’s ADB keyboards, while of high quality, were similarly expensive. The only inexpensive machine in the lineup by the late 1980s was the several-year-old Mac Plus, which was now selling for around $1,800. 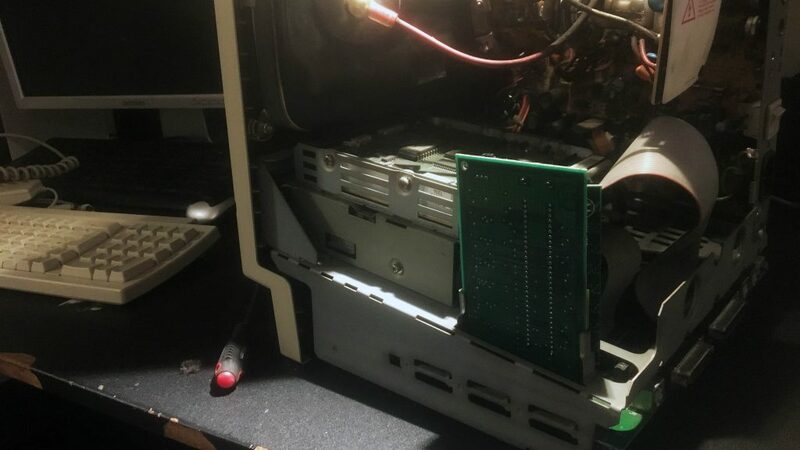 With the “low-left” of the market it had abandoned years earlier booming with IBM PC clones, and being ignored on the high end for UNIX workstations from the likes of Sun and SGI, Apple’s fortunes of the 1980s quickly reversed. The Christmas season of 1989 drove this point home, with the first decrease in sales in years, and an accompanying 20% drop in Apple’s stock price for the quarter. In January 1990, Gassée resigned and his authority over product development was divided among several successors. Many Apple engineers had long been pressing for lower-cost options in order to build market share and increase demand across the entire price spectrum. With Gassée out, a rush started to quickly introduce a series of low-cost machines. Three market points were identified, a very low-cost machine aimed at costing $1,000, a low-cost machine with color graphics, and a more upscale color machine for small business use. In time, these would develop as the Classic, Macintosh LC, and Macintosh IIsi. Unlike the ‘020 and ‘030 based models, the Macintosh Classic has the original Macintosh startup sound. I got this Macintosh from a local advert. My Classic is the model that was factor fitted with the 40 MB hard drive and the RAM expansion card. The RAM card had 2 x 1 MB 30 pins SIMM modules installed in addition to the standard 1 MB, giving the Mac a total of 4 MB RAM. I powered the machine on, and it booted right up. Sound was not working, not even when connecting external speaker. This is a typical sign for capacitor leakage in this model I think, even though everything else is working fine. I gave the machine throughout clean and scrub and then split the case open after removing four hex-screws. There is eight electrolytic SMD capacitors on the main board in this model. Aging SMD capacitors are usually in need to be replaced, as they leak and make all sorts of problems much more often than hole through mounted capacitors. The leakage might be not visible at all without first removing the capacitors. After I replaced the capacitors, also the audio was working. 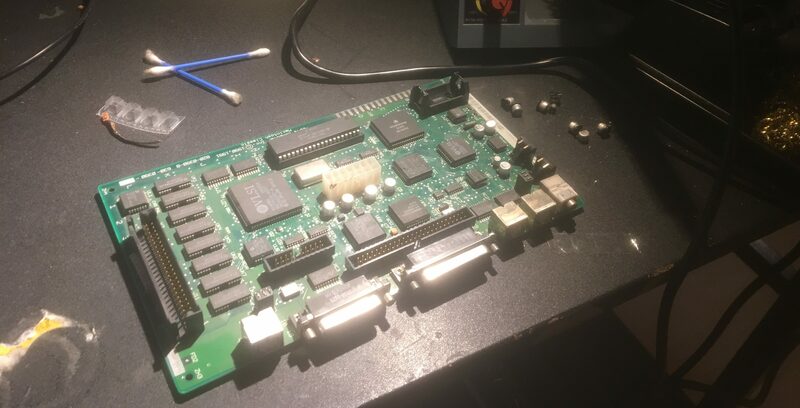 Replacing the SMD electrolytic capacitors on the Mac Classic main board. Floppy drive wouldn’t first read formatted diskettes. After cleaning the reader-head within the drive with some alcohol, it would read diskettes and worked perfectly. Luckily there was no battery leak and the battery was in a holder, so it was easy to remove. Ordered a new 3.6 volt lithium battery on eBay.